Back pain is such an obvious problem in our day-to-day lives that we either let it get the best of us, take way too many over-the-counter pain or anti-inflammatory pills, or run to the doctor for physical therapy or surgery. And you know the pain or spasm is coming (or going to get worse than it already is), because you had a stressful day at work or you lifted too many boxes or pull a weed the wrong way from your beautiful garden. 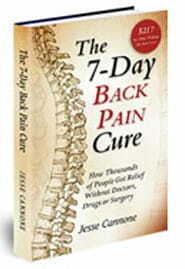 The good news is that suffering back pain need not be a part of your daily routine. All you need to do is engage in a few easy exercises to loosen up and restore proper posture, and your back will be supple in no time. You don’t need a personal trainer or a gym membership, or even a lot of space to do them. And these three simple exercises should always be your first line of “therapy” when you feel a twinge of discomfort... and certainly long before you reach for the pain relievers or muscles relaxants. A few relaxed sets of each of these exercises can immediately make you feel better, and prevent a needless trip to the doctor. These simple exercises are knee bends, waist twists and hip rolls. They are a great way to get the blood moving, release those feel-good endorphins, stretch the muscles, restore normal range of motion and help you detox those nasty toxins that cause pain and inflammation. These are the secrets to back pain relief — and prevention. Since these simple exercises contract and extend the major muscle groups, including the core stabilizing muscles, you can do them anytime with varying degrees of difficulty. Simply adjust them as you get more accustomed to doing them. Done regularly, these beneficial exercises will increase your health and fitness levels by promoting blood circulation and releasing muscle tightness and spasms, thus helping to tone your body. They will make you feel warmer and even help improve your digestive health as they assist the action of your intestines to move the bowels and aid in the detoxification process. Detoxing is important when considering pain, as toxins (metabolic waste) in the blood and muscles creates inflammation and pain. Stand back away from your support and stand with legs at shoulder-width apart. 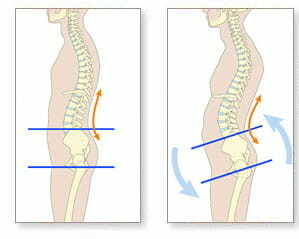 Tighten your abdominal muscles and put your hands on your hips. Imagine you have a hula hoop, or are doing the hula, and rotate your hips clockwise 5 times, then rotate them counter-clockwise 5 times. Be sure to relax and smile and breathe naturally with this exercise. With your hands relaxed at your sides and with feet a shoulder-width apart, simply start swinging your arms right then left, patting both hands on your lower back as they reach around. This will massage the kidneys. Be sure not to swing or pat too hard, just in a relaxed easy motion! Breathe naturally and relax. Simply do a count of 10, and then relax. Then move onto the next exercise. Do some gentle, relaxed knee bends. If you have knee or back issues it is best to do them with the assistance of a chair, table or desk. Stand in a relaxed shoulder-width position and place your hands on the support. Tighten your stomach muscles and exhale while bending your knees and going down as far as you can without falling or straining your knees. Inhale while standing up. Do 10 of these to finish this quick exercise circuit. The complete series of these three simple exercises only takes about two minutes to complete. Initially, try to do the exercises three times each day. So take an exercise break at work instead of a coffee or cigarette break! You'll be delighted on how good your low back will start to feel over time. What if you could eliminate your back pain in as little as 7 days from now, without surgery, and without potentially harmful pain killers? Well, you CAN, but you absolutely MUST use the right strategies, or you do more harm than good. For a limited time, the Healthy Back Institute is running a very unique promotion and has decided to GIVE AWAY a certain number of FREE hard copies of their best-selling book, The 7-Day Back Pain Cure, as a one-time special promotion to get extra publicity.